Admob has just released its February 2010 Mobile Metrics Report and the data is showing some interesting trend in the worldwide mobile traffic scene. Â Key point is the fact that Admob’s worldwide traffic for smartphones contributes 48% to the total mobile traffic in February 2010. This is a big increase from last year’s 35%. And guess where those traffic are coming from? – heavy application usage on iPhone and Android phones. 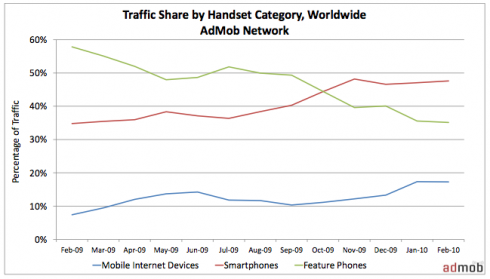 Meanwhile the other two mobile categories, feature phone and mobile Internet devices also get some increase in traffic. Â Although overall traffic from feature phones decreased to 35% from 58% in the same period last year, its absolute traffic still increased by 31%. For mobile Internet devices, worldwide traffic grew to 17%. Most of the traffic from this kind of devices came from the iPod Touch, Sony PSP and Nintendo DSi. Â Would these change once the iPad is shipped? That remains to be seen. But as well know the iPad belong to this category. For the traffic per smartphone category, as expected the iPhone still gets the biggest chunk of mobile traffic as monitored by AdMob. Share of smartphone requests for the iPhone increased from 33% to 50%. Â For Symbian platform, the share of request decreased from 43% to 18%. 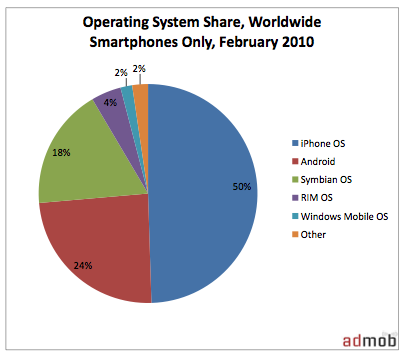 And guess which platform is getting Symbian’ share of request? Â Obviously it’s the Google Android mobile platform.Â In fact Android is now the fastest growing mobile OS on a year-over-year metrics. The top five Android devices as noted by AdMobe are the Motorola Droid, HTC Dream, HTC Hero, HTC Magic, and the Motorola CLIQ. With the increasing popularity and media mileage being gained by location-based social networking sites such as Gowalla and Foursquare, it is not surprising that the Facebook people will take notice of this. And this could be threatening to Facebook especially since this location-based social networking services can take away a number Â of users from them. So, what’s the best way to handle this threat? – Facebook decides to offer the same location-based services. NYT Bits Blog is reporting that Facebook is preparing to launch a new feature that will allow users to share their location. Â This will be launched in late April, just in time for Facebook’s f8 developer conference. What this means is that starting April expect to receive status updates from your friends stating their current locations. But of course, sharing location among friends is just the tip of the iceberg. Â This new feature could also be the start of a social recommedation feature which eventually would bring in more brand participation Facebook. Facebook’s location feature will either be through Facebook’s site or through APIs that will be made available to small time developers. It’s too early to tell whether which of the location-based services will this new Facebook kill. Although according to the report, Facebook is not really eyeing any of these startups but rather a bigger competitor – Google with its small-business advertising program powered by Google Latitude. Amazon Associate Launches “Share on Twitter” Feature, Sponsored Tweets in Sheep’s Clothing? I’ve created an Amazon Associate account a long time ago but never get to earn significantly from the referral program. The only time I got a commission from a sales coming from Amazon links from my blog is when a friend click on the link and actually purchase the product online. Federated Media Publishing (FM) and Apartment Therapy Media, a network of home-oriented social media sites, announced an exclusive partnership. Founded by author and interior designer, Maxwell Gillingham-Ryan, Apartment Therapy is devoted to helping people make their homes beautiful, organized, and healthy. In April 2004, Maxwell, with his brother Oliver Ryan, launched the site which has since become one of the most popular and influential design blogs in the country. Apartment Therapy Media represents more than 3 million unique readers and 20 million pageviews per month. VideoEgg has released AttentionRank, an innovative ad delivery approach to optimize the placement of brand advertising and maximize user attention and engagement. AttentionRank is a systematic approach that identifies when and where users are most receptive to a brandâ€™s messageâ€”evaluating media not on an impression basis but on its ability to capture attention. By analyzing three key factors â€” engagement with the ad, time spent with a brand message and secondary user actions such as click-through rates â€” AttentionRank enables VideoEgg to understand where to place brand messages to capture user attention, increasing the time users spend with an advertisersâ€™ content by an average of 15 percent. AttentionRank enables the company to provide brand advertisers more time spent with their content. Having delivered hundreds of brand campaigns, VideoEgg has gained insight into how time on page, ad size and placement, content and user mode influences the attention value of media.